We hope you are enjoying your bottle of finest Benny T’s Very Versatile and Most Delicious Roasted Tomato, Garlic and Chilli Sauce. Below, a quick reminder of what this sauce is good for; below that, a recipe for the tastiest Chilli con Carne this side of Mexico City! Finally, a few other tasty ideas for you to try out. A tangy, rich and mildly spicy tomato-based chilli sauce up to almost any occasion in the kitchen. Keep refrigerated and shake well before each use! Use as a condiment to liven up your chips, burgers or toasted sandwiches with a hot twang. Great in combo with mayonnaise, side by side or mixed together. Use as an ingredient to bring that warm heat to your chilli con carne (suggested recipe below), or to spice up your tomato soup or beans on toast. Use as a marinade for some chicken or pork overnight before grilling or barbecuing. Quantities and some other specifics at the chef’s own discretion; this mainly stands as a suggested twist to whatever chilli con carne recipe you’re used to. As a ballpark I’m usually aiming to make enough for 4-6 portions. – In a large crock pot, fry up some onion, a couple of cloves of garlic and two bay leaves in a little sunflower oil until starting to soften. – Add a tablespoon of ground cumin and up to a teaspoon of ground paprika. Stir in. – Add mince and continue to fry on a medium heat until meat is coloured all the way through. – Add kidney beans and cook for two minutes. – Add enough beef stock to cover maybe half of the ingredients in the pan. Even beef gravy can work. – Then add half as much again of black coffee – I find it’s best to make up some decaffeinated coffee in a caffetiere and add it in, but instant coffee should be acceptable in this instance too. – To this add a few squares of dark chocolate. 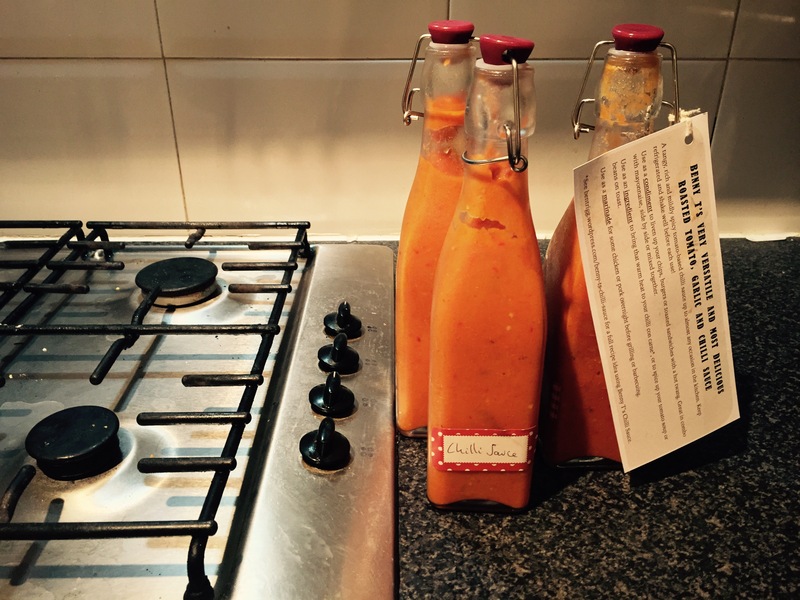 – Now you can add a healthy dollop of Benny T’s Chilli Sauce. It’s a mild sauce so don’t hold back, but you can add it to taste – go easy at first if you like, taste it later, and add more if desired. But I would suggest beginning with at least a tablespoon and a half. – Season liberally with salt and pepper, then cover and leave to simmer for 20 minutes to allow all the flavours to come together. – Stir, taste and season with more salt and pepper or Benny T’s Chilli Sauce if desired. Remember to take out the bay leaves before serving. – Empty a large bag of plain nachos into a baking dish, drizzle all over these a thick helping of Benny T’s Chilli Sauce, then grate a significant amount of cheese on top. Grill on high for a few minutes. If you know how to slow cook a shoulder of pork in barbecue sauce and coke (and yes, it pretty much is that simple), why not throw in some Chilli Sauce to liven it up a bit? Serve with coleslaw in lightly toasted buns. And maybe a little more Chilli Sauce. Yum. Baked beans can be brought to life in all sorts of ways. Worcester sauce; a bit of extra pepper; tomato puree; and how about some of Benny T’s finest? Why not all of the above?